The Notrax 737 Diamond Plate Runner provides for sure footing by way of its diamond patterned top which protects workers from slips and falls. The Notrax Diamond Plate Runner is manufactured from durable, easy to clean, vinyl runner that has been manufactured from 100% recycled materials. The Diamond Plate 737 features a low profile that easily accommodates on and off cart traffic while protecting floors. The Notrax 737 can easily be cut to custom sizes with a scissors or knife. 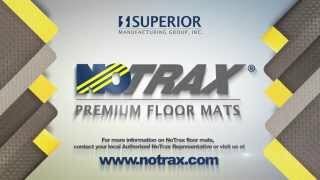 The Notrax 737 Diamond Plate industrial runner works well anywhere slip protection is needed with minimal anti-fatigue relief such as aisles, warehouses and vending areas. The Notrax 737 Diamond Plate Runner is available in three sizes. The Notrax 737 Diamond Plate Runner is available in black, gray, or black with a yellow border that runs lengthwise.